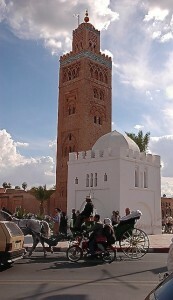 The famous Koutoubia Mosque dominates the skyline of Marrakech. Koutoubia Mosque is 77 meters high, including it’s majestic minaret, and was built in 1158 by the Almohad Caliph Abd al-Mu’min (1094–1163) then completed by his grandson the Almoravid Sultan Yacoub El Mansour in 1195. Caliph Abd al-Mu’min also built the Giralda Tower in Seville and the Hassan Tower in Rabat which was never completed. The towering square Koutoubia minaret in Marrakech is all the more striking because the limestone walls remain undecorated by modern restorers. At the time the area around Koutoubia was the centre of the old city and the Almohads had built a palace there which was later destroyed but you can still see the foundations. The courtyard of the mosque in Marrakech originally housed booksellers and scribes who could write documents, hence the Arabic name kutubiyyin gave its name to the Koutoubia or book seller’s mosque. The call to prayer rings out from the Koutoubia minaret and is echoed by all the mosques in Marrakech which is a wonderful sound particularly in the early morning. The Malakite rite in Morocco permits the call to prayer to be sung and depending on the muezzin who conducts the call to prayer, it can be very beautiful. Moroccans, as with all muslims, pray five times a day and their religion rules their daily lives. Whilst a non believer cannot enter the mosque, the exterior view of Koutoubia both from a distance (it can be seen from 29 kms) and close up is a stunning sight and is Marrakech’s icon. It is floodlit at night. The minaret of the Kasbah mosque known as the El Mansouria, is in the old fortified city close to the Bab Agnaou adjacent to the Saadian tombs. The minaret of the Kasbah Mosque resembles Koutoubia. Built in 1190 by Sultan Yacoub El Mansour it was restored in the 16th Century. The minaret is decorated with green and white zellij tiles. The Mouassine mosque on Rue Mouassine is just up from the Dar El Bacha Palace. 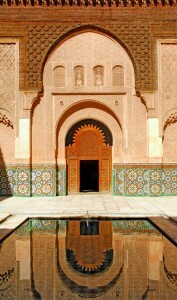 It is a large and imposing building with a hammam , a medersa and a large fountain in a square to the left of the mosque. It was built by the Saadian Sultan Abdullah el Ghalib in 1560.The Bab Doukala mosque was also built by the Saadians in 1557 who built also built several other mosques including the Barrima mosque, the Zaouia of Sidi Bel Abbes, the Zaouia of Sidi Ben Slimane al-Jazouli, Zaouia of Sidi Youssef Ben Ali, and the Sidi Moulay el Ksour mosque. The Ben Youssef Mosque is on the main square close to the Marrakech Museum and the Medersa Ben Youssef was originally built by the Almoravid ruler Youssef Bin Tachfine in 1070 and his son Ali Ben Youssef built the largest mosque in the city on the site to be the center of the new city after the conquest by the Almohads . It was built between 1121 and 1132 and was said to have cost a fortune to build with a huge fountain in the central courtyard. It was refurbished by the Saadian Sultan Abdallah al Ghalib and the Saadians also built the magnificent Medersa Ben Youssef between 1563-1564, which tourists can enter . You can also see the Koubba Ba’adiyn with its superb carvings in its dome which was part of the orginal mosque. It is in the park facing the mosque and you can buy a ticket for it in the Medersa Ben Youssef. The Ben Youssef Mosque underwent a further architectural transformation in the 19th Century by the Alaouite Sultan Suleiman who restored the mosque which had fallen into ruin in the 17th and 18th Centuries but all traces of the Almohad and Almoravid interiors were lost. Mosques in Marrakech have undergone a continuous process of recreation along with the Medina. The situation only stabilised during the French Protectorate and subsequent post independence restoration efforts. Today the Ben Youssef Mosque dominates the square with its imposing walls and if you are lucky you may be able to see inside through its large door. In the alleyways of the Medina you can glance through open door ways and sometimes catch a glimpse of the interiors, many are plain white with arches .Sometimes there is raffia matting around the walls and carpets laid on the floor. On Fridays it is worth watching the prayers and sermons of the imam on the 2M TV channel in Morocco’s finest mosques to see some of the interiors. The Ben Saleh Mosque is in a square at the end of Derb Dabachi. 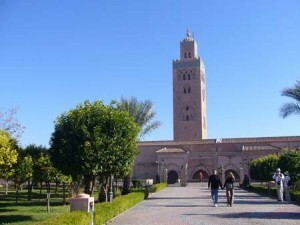 It is remarkable as being the sole example of Merinid architecture in Marrakech .It is currently been refurbished. Behind the mosque is the Medersa Ben Saleh which was built n 1671 by Sultan Moulay Rachid and has been completely restored having been a ruin for many years. There are hundreds of mosques in Marrakech both ancient and modern and new mosques continue to be built many with the financial support of the Kingdom of Saudi Arabia. 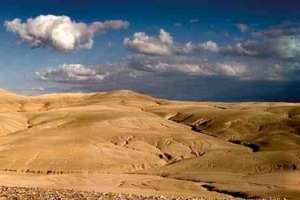 The Agafay Desert of Morocco sits on outskirts of Marrakech. The Agafay Desert is just an hour’s drive from the bustling souks, the Majorelle Garden, the Koutoubia Mosque and the heart of Marrakech. The Agafay Desert is an undeveloped area and is the perfect one-day excursion from Marrakech if you don’t have time to visit the Merzouga, M’hamid or Zagora Sahara Desert during your Morocco vacation. On a one-day excursion from Marrakech to the Agafay Desert you can also visit Kasbah Tamadot, owned by British mogul Richard Branson and stop to visit the local souks and co-ops within the Ourigane Valley. Settled by nomads from the Sahara in the 18th century the Agafay Desert’s landscape is covered with wheat, barley and flowers however in the summer and autumn months it looks similar to the real desert with flowing dunes and the bonus of majestic High Atlas Mountain views nestled just behind it. In spring Agafay offers up wildflowers among other flora and fauna which make it a scenic experience. During a one-day Agafay Desert excursion you can have tea or dinner with a Saharawi or Berber family in a village for a real taste of desert life or visit Lake Takerkoust. 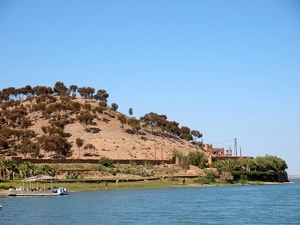 Lake Takerkoust is a manmade lake on the edge of the Agafay Desert that was built under the French Protectorate between 1929- 1935 to provide Marrakech and the surrounding cities with electricity as well as to irrigate the agricultural fields in the plain of Haouz. In the construction of Lake Takerkoust, also referred to as Lalla Takerkoust, great care was taken to ensure that the lake would blend in with the beautiful surroundings and enhance the area. Visitors will agree that this objective was achieved and with the majestic Atlas Mountains reflecting in the tranquil waters of the lake. Lalla Takerkoust has contributed in making this beautiful part of Morocco even more appealing. A number of restaurants in the vicinity of Lalla Takerkoust provide visitors with a variety of food options, from French gourmet food to traditional Moroccan dishes accompanied by mint tea and with a spectacular view of the lake and the Atlas Mountains. 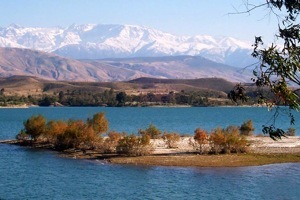 Lake Takerkoust is close to the town of Lalla Takerkoust. Many activities are possible in this region that range from sun bathing to fishing, pedal boating, canoeing, wind boarding jet skiing and quad riding. For those who want to stay overnight in the region a luxury option is Le Pause or Kasbah Agafay. La Pause is a luxury retreat guesthouse nestled in the arid, Agafay hills and an exquisite oasis where riverbeds run among the Moroccan wilderness. Kasbah Agafay is listed among the small, luxury hotels in the world and offers tented suites, a Spa and yoga room. The Agafay Desert and a visit to Lake Takerkoust is a splendid way to see the varied Moroccan landscape without heading all the way to the Sahara Desert.